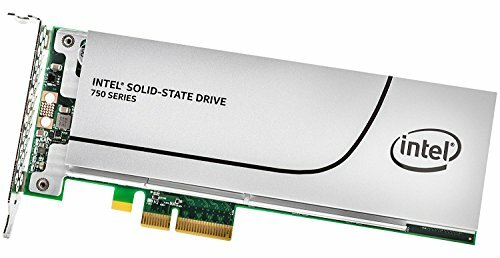 Intel's latest SSD for high performance client and workstation storage market. Intel SSD 750 Series delivers the future of storage today with Intel's first PCIe based consumer SSD, combining four lanes of PCIe 3.0 with state of-the-art NMV Express (NVMeTM) interface for truly amazing performance. The 750 Series SSDs maximizes computing experience by combining four lanes of PCIe 3.0 with state-of the-art NVMe interface. The 750 Series delivers exceptional throughput performance and latency in a client PC SSD & it's truly an industry leader; utilizing NVM Express that allows the 750 Series to shed the burden of legacy AHCI commands. NVM Express - Industry Leading Storage Interface is a standard specification architected from the ground up for Non-Volatile Memory (NVM). It significantly improves both random and sequential performance over SATA-based drives by reducing latency, enabling high levels of parallelism, and streamlining the storage command set. The uncompromising performance of the 750 Series enables you to design and build richer content with larger data sets, textures or assets. The 750 Series offers increased efficiency for engineering workloads: Computer Aided Drafting and Design (CADD), Computational Fluid Dynamics (CFD), Finite Element Analysis (FEA), and Simulation. Add-in-Card and 2.5-inch SFF - Two Form Factors for Flexibility and Ease of Integration. With both Add-in-Card and 2.5-inch form factors, the 750 Series eases migration from SATA to PCIe 3.0 without power or thermal limitations on performance. This allows the SSD to deliver the ultimate in performance in a variety of system form factors and configurations. The Intel SSD 750 Series Add-in-Card (AIC) offers a dynamic solution for current and future systems with an accessible PCIe 3.0 slot.